The workshop will get underway at 5.30pm, with spaces for the event limited. The session facilitators will include Megan Brister, Cyber Security and Privacy Consultant, Deloitte Canada; and Katherine Cupidore, Talent Leader, Deloitte Caribbean and Bermuda Cluster. Two CPE credits are available, with free food to be provided, a cash bar available, and raffle prizes to be won. 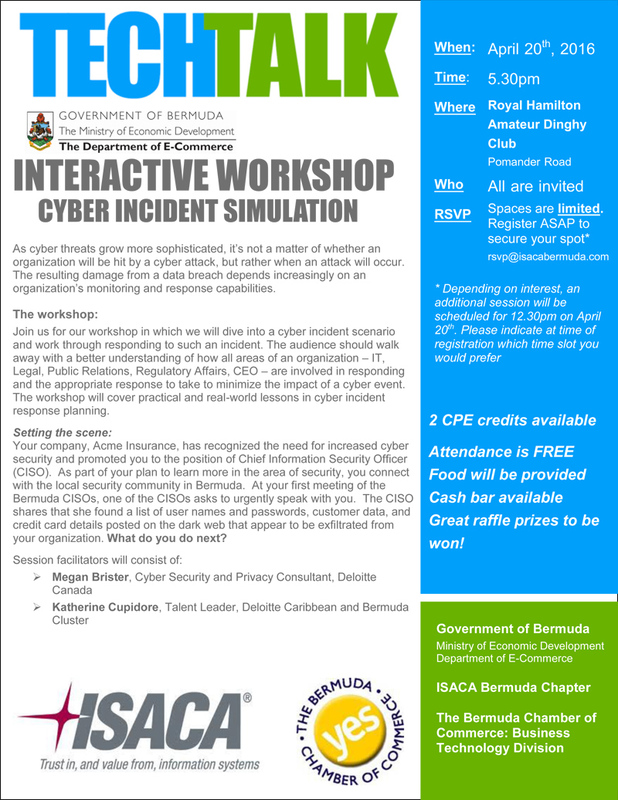 A spokesperson said, “Join us for our workshop in which we will dive into a cyber incident scenario and work through responding to such an incident. “Join us for our workshop in which we will dive into a cyber incident scenario and work through responding to such an incident. The audience should walk away with a better understanding of how all areas of an organization – IT, Legal, Public Relations, Regulatory Affairs, CEO – are involved in responding and the appropriate response to take to minimize the impact of a cyber event. “The workshop will cover practical and real-world lessons in cyber incident response planning. “Your company, Acme Insurance, has recognized the need for increased cyber security and promoted you to the position of Chief Information Security Officer [CISO]. As part of your plan to learn more in the area of security, you connect with the local security community in Bermuda. “At your first meeting of the Bermuda CISOs, one of the CISOs asks to urgently speak with you. The CISO shares that she found a list of user names and passwords, customer data, and credit card details posted on the dark web that appear to be exfiltrated from your organization. What do you do next?